We are sad to pass on the news of the demise of Dr Singha Bahadur Basnyat, who was the Ambassador of Nepal in London from 1997 to 2003, on 5th February 2019. We would like to express our deepest and heartfelt condolences to the grieving family. 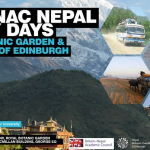 We would like to put on record that it was with his encouragement that the Britain-Nepal Academic Council was founded in 2000.